What’s PARK(ing) Day? PARK(ing) Day is an annual open-source global event where citizens, artists and activists collaborate to temporarily transform metered parking spaces into “PARK(ing)” spaces: temporary public parks. The project began in 2005 when Rebar, a San Francisco art and design studio, converted a single metered parking space into a temporary public park in downtown San Francisco. Since 2005, PARK(ing) Day has evolved into a global movement, with organizations and individuals creating new forms of temporary public space in urban contexts around the world. 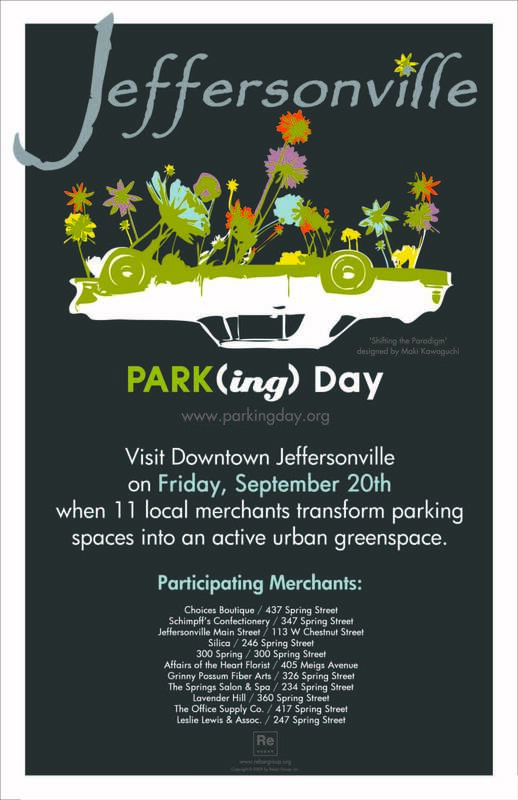 Once again this year, several of Jeffersonville’s downtown merchants will work together to transform parking spaces into ctive urban greenspaces, so you’ll want to make sure you visit beautiful Downtown Jeffersonville this Friday!